What does 'Image preview not available' mean? Will this be visible on my social channel as well? We get the image details of a post from the RSS of that article. Learn more about RSS. There are instances in which the online publisher hasn't passed on the image information to the RSS or the image is too small. In these cases, you'll see Image preview not available. This message will NOT be displayed in the final post on your social channels. We will send the link of the post to the channel. 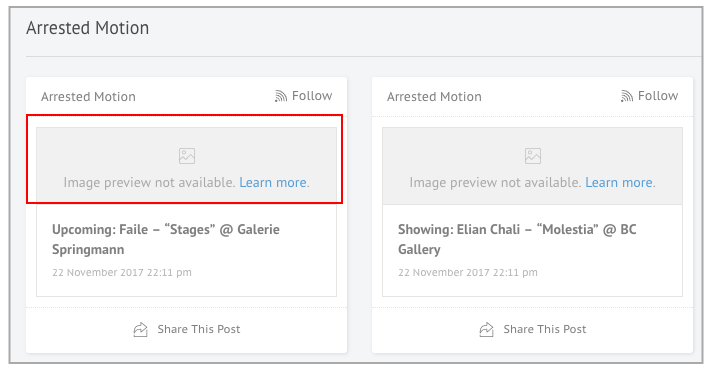 The image that appears with your post on social media will depend on how that channel extracts image information and what they get from the online publisher. If you have any questions, please do let us know from the orange and white comment box in the bottom-right corner of your dashboard.